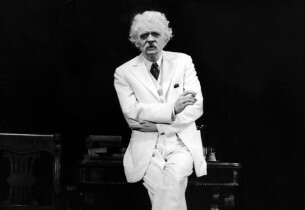 Hal Holbrook’s Mark Twain characterization grew out of an honors project at Denison University, which he attended after serving in World War II. Holbrook and his first wife Ruby had constructed a two-person show, playing characters from Shakespeare to Twain. After graduation they toured the school assembly circuit in the Southwest, doing 307 shows in thirty weeks and traveling 30,000 miles by station wagon. On winter mornings in the Texas panhandle they opened their trunks to find frost on the costumes. Their audiences ranged widely in age, were often unruly, and Holbrook learned to survive on stage or perish. Holbrook’s first solo performance as Mark Twain was at the Lock Haven State Teachers College in Pennsylvania in 1954. That same year he landed his first steady job as an actor – on the daytime television soap opera, The Brighter Day. 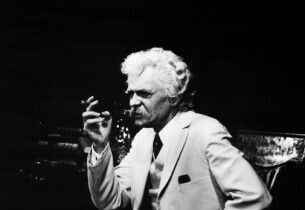 But Holbrook continued to develop his Mark Twain performance, so, after each day’s work on the soap opera, he traveled to a Greenwich Village nightclub to perform as Twain. At one performance, Ed Sullivan was in the audience; he liked what he saw and invited Holbrook on his weekly variety show. This was the break Holbrook needed. So, after five years of researching Mark Twain and honing his material in front of audiences all over America, Holbrook opened Off-Broadway on April 6, 1959. The show was an immediate hit and ran for twenty-two weeks. Holbrook then took Mark Twain Tonight! back on the road, and, gradually, he expanded his Twain repertoire to the point where he had over a dozen hours of material to choose from. As Richard Schickel commented in his liner notes to one of the original Mark Twain Tonight! LPs, “this gave Holbrook the luxury to vary his performances on the whim of an instant, depending on his mood and that of the audience – just as if he were, in fact, Mark Twain thumbing through memory and collected works to select the joke, anecdote or comment that ideally suits the occasion.” In 1966, twelve years after his first solo performance as Mark Twain, Holbrook took Mark Twain Tonight! to Broadway and won a Tony Award® for Best Actor in a Dramatic Role. The performance was taped for a CBS TV special in 1967 and Holbrook added an Emmy® nomination to his many accolades. Holbrook has since toured steadily with Mark Twain Tonight!, performing, literally, around the world. Just as Mark Twain had brought his wit and humor to far-flung places a half-century before, Holbrook-as-Twain performed everywhere from Saudi Arabia and Warsaw to Edinburgh and New Delhi. 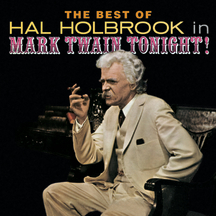 After over 2,000 performances of Mark Twain Tonight!, Holbrook remains as passionate as ever about his life-long role. “Mark Twain is my verbal machine gun,” he says, “to shoot down hypocrisy, fools and swindlers.” As the performances on this CD make abundantly clear, Mark Twain’s humor and social commentary are as timely today as ever.